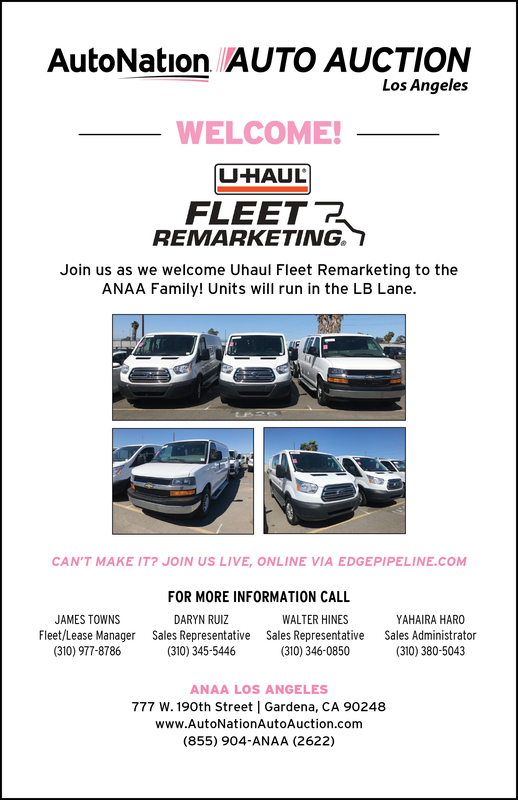 Welcome, Uhaul Fleet Remarketing! CLICK HERE to see what Uhaul will be running this week. NEW AR POLICY - PLEASE READ! Effective 3/25/19, all AR charges billed to a dealership must be paid within 7 days. 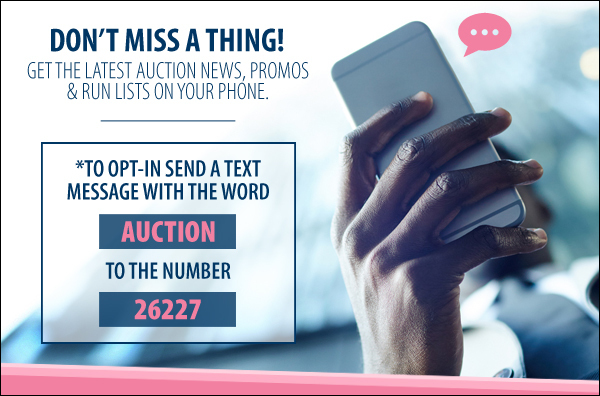 If the charges are not paid within the 7 days, no one from the dealership will be able to receive a bidder badge on sale day. *Message frequency may vary. Message and data rates may apply. We are now using a Red/Yellow/Green Light System & new arbitration policies will take effect which will be more inline with the National Auto Auction Association (NAAA) policies. Please review the arbitration matrix which is posted in the office & online. Any applicable disclosures will be announced by the auctioneer and will be displayed on the in-lane monitors. Ahora vamos a utilizar un sistema de luz roja/amarilla/verde, nuevas políticas de arbitraje tendrá efecto que será más en línea con las políticas de la Asociación Nacional de auto subasta (NAAA). Por favor revise las nuevas politicas de arbitraje que se publicaran en la oficina y en nuestra pagina de internet. Las divulgacions aplicables serán anunciadas por el Subastador y aparecerán en los monitores de la pista. We will no longer print the Bill of Sale (BOS) invoices on the auction block. It is the Buyer’s responsibility to check what they’ve purchased in the front office. We will gladly print a receipt listing all of your purchases or a single BOS upon request. ANAA Los Angeles is partnering with DealShield & will be accepting the DealShield 360 Guarantee program. What does that mean for you? More peace of mind on your purchases. If you have any questions or would like to sign up for the DealShield 360 Guarantee program, click on the link below. Buy a unit in our Early Bird Sale. Every week you buy an Early Bird unit you are automatically entered into our monthly drawing (maximum of 2 entries per week). We will draw and announce a winner prior to the start of the first sale of the month. Need help navigating through our online sale? Click on this tutorial to help answer any questions you may have about buying/selling online. As a reminder, ALL SOLD UNITS & NO SALE CONSIGNED UNITS will be moved into the front parking lot & must be removed by Thursday at 7pm. All vehicles still in the parking lot after this time will be towed by Naylo's Towing at the owner's (buyer) expense. No exceptions. Issues that arise on vehicle history reports will not be arbitrated after 7 days that the vehicle is purchased. 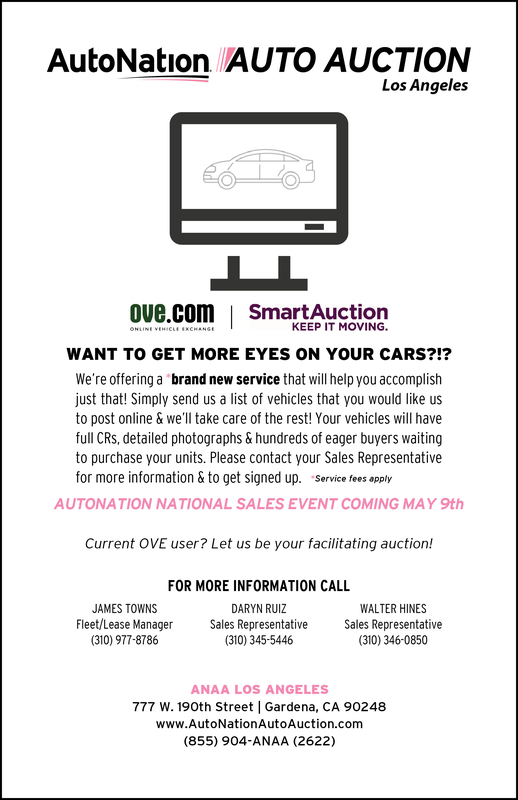 It is the responsibility of all buyers to view & evaluate all vehicle history reports. We provide as much info as possible at the time of sale. Exceptions to this rule will only be arbitrated based on title information.